It’s The Pitcher of Perfect Health! Get sloshed on our daily drink concoction and you’ll beat the bloat, burn some fat, detoxify and energize! Water you waiting for? Add all ingredients to jug of water and store (covered) in refrigerator for up to two days. Let the mixture “steep” for a couple of hours before drinking to allow flavor to intensify. 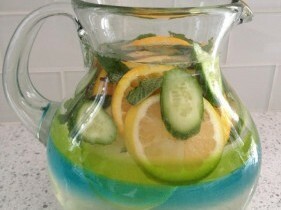 You can add more water to the jug using the same produce, but change the ingredients after two days.